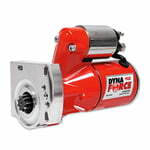 MSD DynaForce starters are built with all-new components and hand-assembled in the USA. For maximum performance and reliability, all starters are dyno-tested and blueprinted before they leave the factory. The armature is balanced during assembly and is guided by two ball bearings for smooth engagement during thousands of starts. MSD DynaForce starters feature a 3.4 hp motor—and a reduced 4.4:1 gear ratio delivers superior torque to start high-compression race engines up to an 18:1 ratio. They include a downsized housing that clears most headers and oil pans, and a billet aluminum mounting block that can be clocked in different positions for tighter clearance applications. These starters are available in a durable red or black powdercoat finish that's designed for maximum protection while looking good. They use a nickel plated, heavy-duty solenoid for optimum performance in severe environments. Order the model designed for fitment with your vehicle application. For use with GM LS1/LS7 style engines. Will not fit GTO.